Serve immediately with some nice crusty SuperValu bread or salad. Heat a large frying pan with 1 tbsp oil and fry the salmon pieces for approximately 2 minutes. Add the crab claws, potatoes, tomatoes, spring onions, crème fraîche and cream and cook for a further 8-10 minutes on a lower simmering heat. Remove from the heat, season lightly and add half of the cheese and allow to melt in the infused cream. 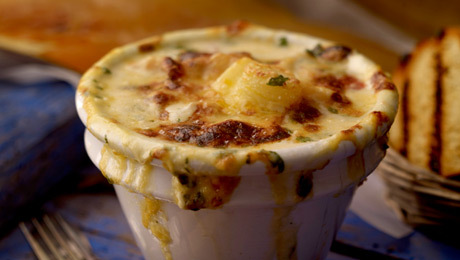 Divide the mixture into 4 ramekin dishes or crock pots. Sprinkle the top with Carrigaline Cheese and place in the oven until the cheese is bubbling and slightly browned.